I don't care what they say, I quite like the race in Valencia. The setting is certainly atmospheric, with long, sweeping straights alongside the water, a very distinctive bridge and even the industrial section giving the GP a character all its own. Rows of millionaire yachts in the marina are all very well but a backdrop of towering cranes and scaffolding is as telling evidence of the energy of the city. It all looks clean and neat, no matter how dusty the track. Admittedly, we are unlikely to get a classic race tomorrow with the McLarens looking so fast and comfortably on the front row. Barrichello gave them a bit of a fight but they swatted him down in Q3. Given their supposed advantage with the best KERS system, one must expect them to stay at the front for the duration of the race. But Valencia is not the only circuit said to be without overtaking places and some of those have given us good races in the past. I will certainly not write off the place on the strength of one race. McLaren's sudden revival also makes early season complaints of a boring season dominated by Button and Brawn seem somewhat ridiculous now. In F1 anything can happen and it was always likely that the other teams would close on the Brawn. With Red Bull performing very well on the faster tracks and McLaren leading the way on the slower, it looks as if Button is going to have to fight hard for his championship and perhaps even lose it at the last. Jenson must be somewhat relieved that the BGP 001 has a slight edge over the Red Bull in Valencia, therefore. Vettel may have qualified a few hundredths quicker than the Englishman but it was a late effort and required all his skill to keep the RB5 under control. In contrast, the Brawns, especially Barrichello's, looked very sure-footed with not a twitch or a slide to be seen. Meanwhile Webber could do no better than ninth, four spots behind. Kimi Raikkonen did an excellent job to get the Ferrari into sixth spot on the grid, although this was hardly noticed as all eyes watched the struggles of Badoer in the second car. Poor Luca has had a terribly discouraging return to the sport and may well be glad if the team give someone else a try in Spa. He has a reputation as a great test driver - it would be a pity to spoil it now with a few awful races. The Williams continues to be one of the best cars of the year and Rosberg duly put it into seventh. Nakajima's chance to outshine his team leader, having been second fastest behind Sutil (who?) in the morning practice, disappeared as the car coasted to a halt in Q1. Surely the lad's luck must change sooner or later; he has brought the speed through from practice into qualifying of late and deserves a few good races in the second half of the season. Renault had flattered to deceive in practice as usual and Alonso could manage no better than eighth, while his new team mate, Grosjean, did well to grab 14th. BMW's improvements to the F1.09 have worked in at least hauling the team off the back of the grid. For a while in practice it looked as though they might be back near the sharp end but even to qualify tenth and eleventh is encouraging, considering how far they had fallen. They have not escaped the Force Indias, however. Adrian Sutil may have been a little disappointed with his twelfth spot, given his incredible performance in practice, but the cars are worthy midfield runners now. Those updates have worked almost as well as McLaren's. Toyota were inexplicably slow after having promised much. Trulli failed to go beyond Q1 and it was only a last gasp effort that allowed Glock to make the cut. I guess it will be mobile chicane time again tomorrow. Buemi did a good job for Toro Rosso but the car has not lived up to the promise of its sister design. And Alguersuari was unable to keep up with his team mate this time, finishing in 19th spot. 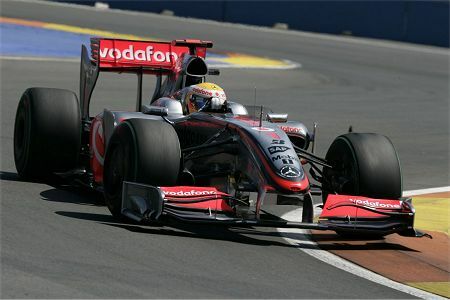 The race is almost bound to be a McLaren tour de force, all the advantages being theirs. But Kovalainen has such awful luck that it is quite possible that he drop by the wayside. Otherwise, it looks like another of those apparently effortless victories for Hamilton, especially as there should be some furious squabbling behind him. The Brawns and Red Bulls are going to be duking it out, their eyes on points for the championship, and Kimi, Rosberg and Alonso will be right there to make the most of any mistakes. "With Red Bull performing very well on the faster tracks and McLaren leading the way on the slower, it looks as if Button is going to have to fight hard for his championship and perhaps even lose it at the last." Do you no think that the performance of the Mclaren's at the slower tracks, maximising the damage in terms of points that Red Bull can accumulate may actually be the thing that wins Jenson the championship? Indeed so, Punter. The point was really that Brawn is faced with tough challengers now, whereas there were none in the early races. Red Bull really need to be the best car at all the tracks if one of their drivers is to beat Button and McLaren has put a spanner in that particular works. There is still a need for Brawn to be competitive however - if they don't continue to score, we could have a situation similar to Kimi's last minute championship. It seems that The Fred had a problem with the front right brake disc, causing a lack of stability when braking hard. He didn't know until Pat Symonds said it to him as the probably cause that make Renault slower today that all along the practice sessions. Anyway, I expect they get it solved tomorrow and be fast again. I suppose it could be a hint that Whitmarsh thinks he could have handled Alonso better than Ron Dennis did. There are many who say that the real problem was not between Fernando and Lewis but between Fred and Ron. I am not so sure that Whitmarsh would have done any better, however. What do you do when the team policy is equality between drivers and one demands special treatment? It ain't easy. You could be right, Becken. I thought the same when I first read that on "El Mundo" newspaper, you know, tipical spanish hype. But then I looked for his english words, and it sounded pretty sincere words to me. i know it is in German but I just love it when someone holds a mic to nico his comments are always raw and truthful. anyway he states his disbelief to see what McLaren have managed to pull off with their updates so far. He commends Williams lean infrastructure and efficiency and also the Toyota engine and even says he is probably this good today because of the engine. He reckons (hints) that Williams will not be able to keep Nakajima and the engine since they want to be further up the grid pointswise. Also, he thinks Nakajima is a good teammate to have that he not too fast but is fast at times as close as two tenths. the missing results are partly Nakajima's and partly the teams fault he also states. In another statement he says he is shocked to see Luca so far off the pace in his own words: "I was 2.7 seconds off the pace when I was seventeen and driving against Montoya's time!" I guess as a joke he ended up commenting that Couthard would be driving Ferrari next. I just love this guy i will never forget his reaction to Schumacher parking his car in Monaco. so all the best to all of you racers and lets see how competitive the McLarens really are. I am currently in hawaii. Does anyone know if speed tv show re runs and if so at what time? That is if I can find a bar that has speed tv in waikiki. Like you Clive, I thought Valencia should have a second chance but I am afraid it can only produce excitement in the pitstop rounds. Congratulations to Rubens, a great race and I think he would have won even if McLaren have done a better pitstop for Lewis. A great race for Kimi, who got 3rd, even though I believe at least 6 cars (Brawn, McLaren, Red Bull) are faster. I think the Ferrari are about the speed as Williams. I have just read that Luca Badoer will continue in Spa. I think it is only because of the short time between the races, because Luca really disappointed everybody, I think. Nelsinho, S. Bourdais, B. Senna, T. Sato, C. Klien, and probably a few more would all have done better than Luca Badoer. I have to apologize to Rubens for my, ‘past his best and should be grateful for such a seat’ attitude. He drove an impeccable race and very much deserved the win. Martin Whitmarsh confirms my time assessment, that although Hamilton was delayed in a rare (for McLaren) pit stop debacle, that alone did not lose the race for Lewis. Kimi? Hopefully his recent performances will continue. Indeed, a long-time fan who readily admitted to his fading performance, but never did lose faith in his fundamental ability to excel.